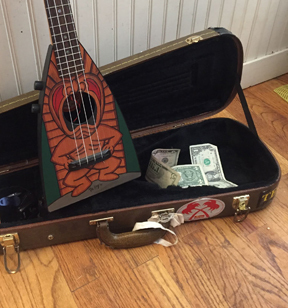 A Plastic Ukulele, possible made by Mastro , Carnival, or Emenee. Headstock features a circle with the words "Ukulele Ike" around the top, a picture of Cliff "ukulele Ike" Edwards wearing a fedora, and then the "Cliff Edwards" signature around the bottom. On The Left side of the Circle it says: Made in USA, and on the Right it says: Pat Pend. I found reference to a recording of Cliff Edwards doing a radio commercial for the "Cliff Edwards "Ukulele Ike" plastic Ukulele, and music course" dated August 22, 1950. so it would be safe to assume that it was produced then.